Pool, Snooker and Billiard Tables: What’s the Difference? The term ‘Billiard’ is actually a generic name that may refer to a variety of games that include pool, pocket billiards, and snooker. Games such as pool as well as snooker require tables with six pockets, while a different version of billiards called carom does not require a table with pockets at all. A snooker table is typically larger when compared to a pool table. On the same note, American pool tables are generally larger than English pool tables. A key feature of a billiard table is that the length is usually twice as long as the width. Pool tables and snooker tables vary in size, but in most cases, their lengths fall between 6 and 12 feet. It is, however, important to note that the type of billiard game has to do with more than just size of the table – there are obviously other factors involved. What are the tables used in competitive events? For competitive events, the tournament organisers always outline the exact equipment specifications for their tournament. These specifications outline various table parameters ranging from the type of fabric used in the cloth to details about the table’s construction and the colour of the cloth, as well as lighting details. For purposes of home entertainment or leisure, however, having a table that fits into the room with enough space to spare for the players to navigate their way round the table will usually suffice. That being said, it is important to note that having too small a table can seriously limit the amount of fun the players have whilst playing. Likewise, a 12-foot long pool table may not be a good idea for a pool table meant for the home, since smaller children are likely to experience considerable difficulty playing on it. 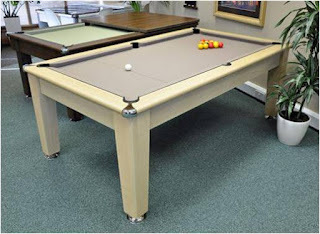 The optimum sizes for home pool tables are tables that are between 6 and 8 feet long. One of the areas where American and English pool tables are different is in the pocket details. English pool and snooker tables have smaller pockets compared to the American tables. Secondly, American pool uses balls that measure 2 ¼ inches in diametre, while English pool balls measure 2 inches in diametre. Meanwhile, in English pool or snooker, the pockets are three inches across. The cushion shape of English vs American pool tables also tend to be different. The cushion shape is important because it has a direct impact on how the balls will bounce off once they hit the cushion. The game of pool is a highly engaging game and is ideal for bringing family and friends together. It can be difficult for a customer to choose a good and high-quality table without knowing some of the key differences among the various types of billiard games such as pool and snooker, as well as the equipment used for each game, including the table. At the end of the day, however, whatever kind of table you decide to purchase, the important thing is to have fun with it and enjoy it as much as you can. Nick Greenslade is a big pool enthusiast who participates regularly in armature pool tournaments across the UK. When not shooting a game of pool on his pool table, Nick enjoys writing and sharing his knowledge of the game by contributing blog posts to various pool-related websites.